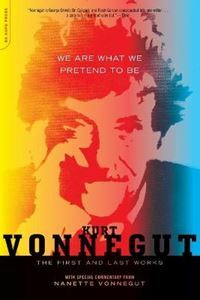 Quick overview Kurt Vonnegut's first and last works come together for the first time in print, in a collection aptly titled after his famous phrase, We Are What We Pretend To Be. When Vonnegut passed away in 2007, he left his last novel unfinished. Entitled If God Were Alive Today, this last work is a brutal satire on societal ignorance and carefree denial of the world's major problems. Protagonist Gil Berman is a middle-aged college lecturer and self-declared stand-up comedian who enjoys cracking jokes in front of a college audience while societal dependence on fossil fuels has led to the apocalypse. Described by Vonnegut as, "the stand-up comedian on Doomsday," Gil is a character formed from Vonnegut's own rich experiences living in a reality Vonnegut himself considered inevitable. Along with the two works of fiction, Vonnegut's daughter, Nanette shares reminiscences about her father and commentary on these two works-both exclusive to this edition. In this fiction collection, published in print for the first time, exist Vonnegut's grand themes: trust no one, trust nothing; and the only constants are absurdity and resignation, which themselves cannot protect us from the void but might divert.